If progressives are so interested in protecting the environment and being a voice for those who can't speak, why were their representatives out en masse in Calgary this past weekend? Heck, Justin Trudeau even had a contest where "you and a friend" could join him at the Stampede. And if you can't figure out why having these and other animal events take place for "entertainment" purposes (fairly certain the animal would use different terminology to describe what it was being forced into) is particularly depraved, then there is little that can be said. All the aforementioned should not even be up for discussion. This isn't the 19th century, though this country's animal welfare legislation, largely unchanged since the 1890s, might suggest otherwise. (The Conservatives have introduced some improvements to it, but too few. Canada still routinely ranks poorly in international animal protection rankings.) We know that animals feel pain and fear and we know that they suffer. Their lives are valuable -- or should be considered so -- not for what they bring to us but for the fact that they are living, sentient beings. What I'm wondering about is Rachel Notley, specifically, and our other "progressive" politicians in general. When Notley was elected Alberta premier, my animal advocate friends and colleagues were ecstatic. More women in power! More leftists! More progressive policies! More goodness and niceness! I have to wonder how these same people now feel about the fact that Notley, like other federal party leaders and many provincial and municipal politicians, showed up at the Calgary Stampede, cowboy hat and all, apparently not prepared to use her new power for goodness and niceness, at least where other species are concerned. If progressives are so interested in protecting the environment and being a voice for those who can't speak, why were their representatives out en masse in Calgary this past weekend? Heck, Justin Trudeau even had a contest where "you and a friend" could join him at the Stampede. "Honey, you want to have pancakes with Justin Trudeau and then go watch an animal being terrorized or driven to an early death?" I attempted to contact several of Canada's progressive leaders to ask where they stood on the treatment of animals at the Stampede. So far, only May has responded. She stated that she does not attend any animal events at the Stampede and that she is against calf-roping and chuck-wagon races. I appreciated her response and her clarification and I understand that the Stampede is, in many ways, like Toronto's Pride Parade -- politicians are expected to be there and it's a way for them to pretend they're at ease with all voters. 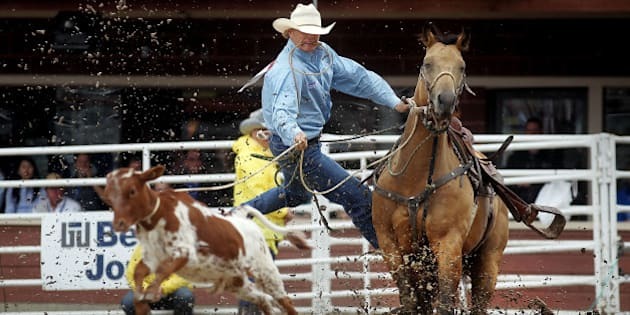 But wouldn't May and others make a more powerful statement by not attending the Stampede in any capacity until inhumane rodeo events are cancelled?